The foreign relations of New Zealand are oriented chiefly toward developed democratic nations and emerging Pacific economies. The country’s major political parties have generally agreed on the broad outlines of foreign policy, and the current coalition government has been active in promoting free trade, nuclear disarmament, and arms control. All New Zealand's important relationships are in good repair....With the United States there are hopes of a major breakthrough in terms of trade relations. Sino - New Zealand relations are also subdued, but trade is burgeoning. Japan's decision to join the Trans-Pacific Partnership is a welcome change and New Zealand continues to pursue a free trade agreement with South Korea. The government is pressing ahead with plans to strengthen relations in a number of other areas, including Russia, South Asia, Latin America, the Persian Gulf and especially the South Pacific. It is also alive to the potential benefits of closer ties with countries on the African continent. New Zealand was first settled by Polynesians at some point between 800 and 1300 AD. From the 1760s New Zealand was visited by various European explorers and traders, and later missionaries and settlers. An informal system of trade was established, especially in Northland, and some iwi (tribes) became wealthy and powerful. As Māori was a tribal-level society of many shifting chiefdoms, relationships with Europeans were ad hoc and informal. In 1835 a group of Northland chiefs, under the guidance of British resident James Busby, signed a declaration of independence, which was recognised by Britain. Many Māori were still worried that a European power might invade and dispossess them, and some iwi were having difficulties controlling the large numbers of Europeans who visited and settled in their areas. English missionaries were also concerned about the levels of lawlessness, which were undermining their efforts to convert Māori to Christianity. The British Colonial Office, influenced by the missionaries and by reports that the independent New Zealand Company was planning to privately colonise the islands, sent naval captain William Hobson to negotiate a treaty. The subsequent Treaty of Waitangi, signed in 1840, made New Zealand part of the British Empire, established a Governor of New Zealand, and gave Māori the rights of British subjects. The annexation of New Zealand by Britain meant that Britain now controlled New Zealand's foreign policy. Subsidised large-scale immigration from Britain and Ireland began, and miners came for the gold rush around 1850-60. In the 1860s, the British sent 16,000 soldiers to contain the New Zealand wars in the North Island. The colony shipped gold and, especially, wool to Britain. From the 1880s the development of refrigerated shipping allowed the establishment of an export economy based on the mass export of frozen meat and dairy products to Britain. In 1899-1902 New Zealand made its first contribution to an external war, sending troops to fight on the British side in the Second Boer War. The country changed its status from colony to dominion with internal self governance in 1907. New Zealand eagerly sent a large fraction of its young men to fight on Britain's side in the First World War. Their heroism in the failed Gallipoli campaign made their sacrifices iconic in New Zealand memory, and secured the psychological independence of the nation. After the war New Zealand signed the Treaty of Versailles (1919) joined the League of Nations and pursued an independent foreign policy, while its defense was still controlled by Britain. Wellington trusted Conservative Party governments in London, but not Labour. When the British Labour Party took power in 1924 and 1929, the New Zealand government felt threatened by Labour's foreign policy because of its reliance upon the League of Nations. The League was distrusted and Wellington did not expect to see the coming of a peaceful world order under League auspices. What had been the Empire's most loyal dominion became a dissenter as it opposed efforts the first and second British Labour governments to trust the League's framework of arbitration and collective security agreements. The governments of the Reform and United parties between 1912 and 1935 followed a "realistic" foreign policy. They made national security a high priority, were skeptical of international institutions such as the League, and showed no interest on the questions of self-determination, democracy, and human rights. However the opposition Labour Party was more idealistic and proposed a liberal internationalist outlook on international affairs. From 1935 the First Labour Government showed a limited degree of idealism in foreign policy, for example opposing the appeasement of Germany and Japan. When World War II broke out in 1939, New Zealand whole-heartedly joined in the defence of Britain, with Prime Minister Michael Joseph Savage declaring that "where Britain goes, we go; where Britain stands, we stand". New Zealand soldiers served in North Africa, Italy and the Pacific, and airmen in England and the Pacific, throughout the war, even when New Zealand had concerns about invasion by the Japanese. In 1947 New Zealand ratified the 1931 Statute of Westminster, which made certain former colonies completely self-governing. The Fall of Singapore during World War II made New Zealand realise that she could no longer rely on Britain to defend the British Empire. New Zealand troops supported the British in the successful battle against Communist insurrection in Malaysia and maintained an air-force fighter squadron in Singapore, and later on Cyprus, again supporting British forces. New Zealand diplomats sought an alliance with the United States of America, and in 1951 adhered to the ANZUS Treaty between New Zealand, Australia and the US. In return for America's guarantee of protection, New Zealand felt obliged to support America in its wars, and New Zealand committed forces to the Korean War (1950-1953) under United nation auspices and to the Vietnam War. By the 1970s, many New Zealanders began to feel uncomfortable with their country's support for the US, particularly in Vietnam and regarding the visits of nuclear-powered and armed American warships. The Third Labour government (1972–1975) pulled New Zealand troops out of the Vietnam War and protested against French nuclear testing in the Pacific, at one stage sending a warship to act as disapproving witness to the tests. Britain's entry into the European Economic Community in 1973 forced New Zealand into a more independent role. The British move restricted New Zealand's trade access to its biggest market, and it sought new trading partners in Asia, America and the Middle East. Australia and New Zealand signed the free-trade Closer Economic Relations agreement in 1983. The election of the Fourth Labour Government in 1984 marked a new period of independent foreign policy. Nuclear-powered and nuclear-armed ships were banned from New Zealand waters, effectively removing New Zealand from the ANZUS pact. Immigration laws were liberalised, leading to a massive increase in immigration from Asia. The Fourth National Government (1990–1999) liberalised trade by removing most tariffs and import restrictions. In 2008, Minister of Foreign Affairs Winston Peters announced what he called "a seismic change for New Zealand’s foreign service", designed to remedy the country's "struggling to maintain an adequate presence on the international stage". Peters said that the Ministry would receive additional funding and increase the number of New Zealand diplomats serving abroad by 50%. However this policy was reversed following the 2008 General Election which brought the John Key-led Fifth National Government of New Zealand to power. New Zealand was a founding member of the United Nations in 1945. Royal Navy during World War II it became clear that Britain was no longer able to protect New Zealand so the government decided that a policy of independent relations with a group of strong powers was the best way to defend New Zealand. New Zealand participates in the United Nations (UN); International Energy Agency; Asian Development Bank; Pacific Islands Forum; Secretariat of the Pacific Community; Colombo Plan; Asia-Pacific Economic Cooperation (APEC); and the International Whaling Commission. New Zealand also is an active member of the Commonwealth. Despite the 1985 rupture in the ANZUS alliance, New Zealand has maintained good working relations with the United States and Australia on a broad array of international issues. In the past, New Zealand’s geographic isolation and its agricultural economy’s general prosperity minimised public interest in international affairs. However, growing global trade and other international economic events have made New Zealanders increasingly aware of their country’s dependence on unstable overseas markets. New Zealand is a strong advocate of free trade, especially in agricultural products, and is a member of the Cairns group of nations in the WTO. New Zealand’s economic involvement with Asia is increasingly important. New Zealand is a “dialogue partner” with the Association of Southeast Asian Nations (ASEAN), a member of the East Asia Summit and an active participant in APEC. New Zealand administers Tokelau (formerly known as the Tokelau Islands) as a non self-governing colonial territory. In February 2006 a UN-sponsored referendum was held in Tokelau on whether to become a self-governing state, but this failed to achieve the two-thirds majority required to pass. Samoa was a New Zealand protectorate from 1918 to full independence in 1962. However New Zealand retains some responsibilities for former colonies Niue and the Cook Islands which are in free association with New Zealand. Citizens of all three countries hold New Zealand citizenship and the associated rights to healthcare and education in New Zealand. New Zealand has also claimed part of Antarctica known as the Ross Dependency since 1923. McGraw argues that, "Probably the greatest foreign policy achievement of [Helen] Clark's [1999-2008] term was the conclusion of a free trade agreement with China." Clark's government also set up a free-trade deal with Australia and the ten nations of ASEAN (the Association of South East Asian Nations). New Zealand has existing free trade agreements with Australia, Brunei, Chile, the People's Republic of China, Hong Kong, Singapore, and Thailand; new free trade agreements are under negotiation with ASEAN, and Malaysia. New Zealand is involved in the WTO's Doha Development Agenda and was disappointed by the failure of the most recent talks in July 2006. New Zealand's main export is food, primarily dairy products, meat, fruit and fish; about 95% of the country's agricultural produce is exported. Other major exports are wood, and mechanical and electrical equipment. About 46% of exports are non-agricultural, but the largest industry is still the food industry. Tourism is also an extremely important component of international trade: transport and travel form around 20% of the country's export trade. New Zealand does not have large quantities of mineral resources, though it does produce some coal, oil, Aluminium and natural gas. The New Zealand Defence Force is small compared to many other countries although it is regarded as very professional. Its overseas duties consist mostly of peacekeeping, especially in the Pacific. In the 21st century, peacekeeping detachments have been deployed to East Timor, the Solomon Islands, and Tonga. Engineering and support forces have also been involved in the Iraq War, although New Zealand is not a member of the 'coalition of the willing'. New Zealand's heaviest military involvement in recent decades has been in Afghanistan following the United States-led invasion of that country after the 11 September 2001 attacks. The deployment has included SAS troops. New Zealand's official aid programme is managed by the gross national income (GNI) spent on overseas development assistance. New Zealand's contribution was 0.27% of GNI. Much this went to the Pacific region. However, the country is occasionally more generous in responding to major crises, for example donating around 100 million New Zealand dollars to the 2004 Indian Ocean earthquake relief effort. New Zealand troops and aircraft are also often sent to disaster areas in the Asia-Pacific. In the 1970s and 1980s anti-nuclear sentiment increased across New Zealand fuelling concerns about French nuclear testing in the Pacific at Moruroa atoll. The third Labour Government under Norman Kirk, co-sponsored by Australia, took France before the International Court of Justice in 1972, requesting that the French cease atmospheric nuclear testing at Mururoa Atoll in French Polynesia in the southern Pacific Ocean. In 1972, as an act of defiance and protest the Kirk government sent two of its navy frigates, HMNZS Canterbury and Otago into the Moruroa test zone area. Peace yachts attempting to disrupt the French tests had been sailing in coordinated protests into the Mururoa exclusion zones between 1972–1991. Concerns about Nuclear proliferation and the presence of nuclear warheads or reactors on United States Navy ships visiting New Zealand ports continued to escalate. After it was elected in 1984, the Labour Party government of David Lange indicated its opposition to visits by such ships. In February 1985, New Zealand turned away the USS Buchanan (DDG-14) and in response the United States announced that it was suspending its treaty obligations to New Zealand unless port access was restored. In 1987 the labour Government strengthened its stance by declaring New Zealand a nuclear-free zone (New Zealand Nuclear Free Zone, Disarmament, and Arms Control Act 1987), effectively legally removing New Zealand from the nuclear deterrent scenario and banning the entry of nuclear powered warships into its ports. Warships that did not fall into this category were not blocked, but the US took the view that any subsequent visit by a warship to New Zealand could not be carried out without violating the US' security policy of "neither confirming nor denying" nuclear capability of its ships. After increasingly acrimonious debates, in August 1986 the United States formally suspended its security obligations to New Zealand that it had under the ANZUS mutual defence pact. This suspension remains in effect today, although the US no longer carries nuclear weapons aboard its surface naval vessels. In 1987 New Zealand passed legislation making the country a nuclear free zone, namely the New Zealand Nuclear Free Zone, Disarmament, and Arms Control Act; in the same year the US retaliated with the Broomfield Act, designating New Zealand as a "friend" rather than an "ally". Relations between New Zealand and the US have had several ups and downs since then. In recent years, some voices have suggested removing the anti-nuclear legislation, especially the ACT New Zealand political party; and up until February 2006 the National Party was in favour of holding a referendum on the issue. However, public opinion remains strongly in favour of the country's status as a nuclear free zone. In May 2006, US Assistant Secretary of State for East Asia and Pacific Affairs, Christopher Hill, described the disagreement between the US and New Zealand as "a relic" but also signalled that the US wanted a closer defence relationship with New Zealand and praised New Zealand’s involvement in Afghanistan and reconstruction in Iraq. "Rather than trying to change each other's minds on the nuclear issue, which is a bit of a relic, I think we should focus on things we can make work," he told the Australian Financial Review. Pressure from the United States on New Zealand's foreign policy increased in 2006, with U.S. trade officials linking the repeal of the ban of American nuclear ships from New Zealand's ports to a potential free trade agreement between the two countries. Relations between France and New Zealand were strained for two short periods in the 1980s and 1990s over the French nuclear tests at Moruroa and the bombing of the Rainbow Warrior in Auckland harbour. The latter was widely regarded as an act of state terrorism against New Zealand's sovereignty and was ordered by then French President François Mitterrand, although he denied any involvement at the time. These events worked to strengthen New Zealand's resolve to retain its anti-nuclear policy. Relations between the two countries are now cordial, with strong trade and many new bilateral links. 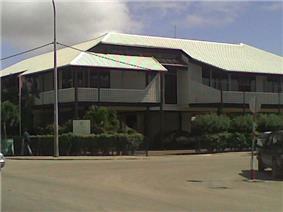 New Zealand High Commission in Nukualofa, Tonga. Much of New Zealand's foreign policy is focused on the Pacific region, particularly Polynesia and Melanesia. Bilateral economic assistance resources have been focused on projects in the South Pacific island states, especially on Bougainville. The country’s long association with Samoa (formerly known as Western Samoa), reflected in a treaty of friendship signed in 1962, and its close association with Tonga have resulted in a flow of immigrants and visitors under work permit schemes from both countries. Recently New Zealand forces participated in peacekeeping efforts in the Pacific region in East Timor, the Solomon Islands and Tonga, see Military history of New Zealand. In 1947, New Zealand joined Australia, France, the United Kingdom, and the United States to form the Pacific Islands Forum), which meets annually at the “heads of government” level. On 26 May, New Zealand deployed forty-two troops, with a second contingent of 120 troops leaving Christchurch on 27 May, en route to Townsville, Queensland before being sent to East Timor. Clark said that the forces would be deployed where needed by the Australian command. New Zealand's relations with Australia are very close; the Closer Economic Relations agreement gives each country access to the other's markets, and the Trans-Tasman Travel Arrangement allows New Zealanders and Australians automatic residency in each other's countries. As a result of the latter agreement, there is substantial migration between the two countries but especially from New Zealand to Australia, with over 500 000 New Zealanders living in Australia and 65 000 Australians living in New Zealand. The Australian Constitution allows for New Zealand to become part of Australia, and although the idea is sometimes floated it has little support in Australia and less in New Zealand. In 2009 there were plans to effectively create domestic flights between New Zealand and Australia, but these have since been put on hold with the change in the Australian government. New Zealand and Canada have a close and longstanding relationship that has been fostered by both countries close history and culture, by extremely close ties to the Commonwealth of Nations and extensive links to people in either country. Both New Zealand and Canada have a common Head of State, Queen Elizabeth II. Canada has said that New Zealand is a valuable international partner despite the thousands of miles separating the two countries. Both share a like-minded view of the world on a variety of issues. New Zealand and Canada have close links whether it be through business or trade relations, the United Nations, the Commonwealth or mutual treaty agreements, New Zealand-Canada relations are extremely important to both countries. China and New Zealand have an excellent relationship which continues to improve. The bilateral relationship has grown to become one of New Zealand’s most important. A free trade agreement (FTA) between China and New Zealand was signed on 7 April 2008 by Premier of the People's Republic of China Wen Jiabao and Prime Minister of New Zealand Helen Clark in Beijing. It is the first free trade agreement that China has signed with any developed country. Historically, New Zealand contact with China started very early in its history with the first records of ethnic Chinese in New Zealand were immigrants from Guangdong Province, who arrived during the 1860s gold rush era, with missionary, trade, extensive immigration and other links continuing during China’s Republican era (1912–1949). The establishment of the People’s Republic of China (PRC) brought these links to a halt. New Zealand formally recognised the PRC in 1972. New Zealand and China celebrated 35 years of diplomatic relations in 2007. Since the 2006 Military Coup in Fiji relationships between the country have turned icy. In 2007 New Zealand's High Commissioner for Fiji Michael Green was expelled from Fiji by Military leader Frank Banimarama. Angry at this action the New Zealand government increased trade sanctions against the country while both major political parties saying the expulsion was outrageous and unacceptable. Stemming from World War II, New Zealand forces fought alongside the Greeks in continental Greece and Crete since then, Greece has claimed a special relationship with New Zealand. An under-equipped force made-up of largely New Zealand, Australian, British and Greek troops fought to protect the island from invasion. The Battle of Crete is commemorated every year in both Crete and New Zealand. Prime Minister Helen Clark led a large party from New Zealand to Crete in May 2001 to attend the 60th anniversary of the battle. The Minister of Foreign Affairs, Hon Phil Goff, attended anniversary celebrations in May 2003 and Hon Annette King in May 2006. The war was followed by a modest wave of Greek emigration to New Zealand. In the 2006 Census 2,547 people primarily identified themselves as being Greek. A bilateral Social Security Agreement came into force on 1 April 1994. India and New Zealand have been strong in some degrees though potentially slightly shaky in others. New Zealand and India are in the midst of considering a free trade deal, where in October 2009 new Indian Prime Minister Manmohan Singh told New Zealand Prime Minister John Key that he was willing to seriously consider a free trade deal. Whilst there is the potential for a free trade agreement between India and New Zealand to be beneficial for both nations, the idea has not been seriously considered with India having strong subsidies on its agricultural sector, one of New Zealand's biggest export markets. New Zealand and India relations have been slightly shaky in October 2010 with the comments of Paul Henry, a New Zealand talk-show host, making fun of Chief Minister of Delhi, Sheila Dikshit on live New Zealand television. The Indian foreign office summoned the New Zealand High Commissioner Rupert Holborow, where the Commissioner set the record straight by making clear that: "[Paul Henry's comments] reflect the views of only one media commentator (who has already been censored for other racist and unacceptable comments), and certainly not the New Zealand Government or people". India Prime Minister Manmohan Singh confirmed a continued intention to pursue a free trade agreement with the New Zealand Prime Minister John Key in late 2010, saying that: "Like China there is a recognition that they have a strong demand for food... so there is something in it for both parties if we can complete a deal". John Key confirmed that India and New Zealand have continued to work "scoping out" the possibility of a free trade agreement but said with caution that in any case "these things take time". Having common interests as democracies and neighbours in the Asia Pacific region, New Zealand and Indonesia are viewed as natural partners. Both countries are members of APEC. Indonesia and New Zealand officially established diplomatic relations in 1950, the diplomatic and economic ties have grown stronger ever since. New Zealand has an embassy in Jakarta and Indonesia has an embassy in Wellington. Indonesia’s commodity exports to New Zealand consist mainly of energy products and minerals as well as lumber and agriculture, while New Zealand's commodity exports to Indonesia mainly consists of dairy products and meats, such as beef, milk, and cheese. New Zealand has a long history of support for Israel beginning with the Partition Plan in 1947. New Zealand was at the very forefront of countries to recognise the State of Israel in the United Nations resolution of 1948. Relations were temporarily suspended around 2004 when two Israeli citizens were convicted of passport fraud, but these were restored soon after. New Zealand joined with other countries in boycotting a UN Racism conference in defence of Israel due to fears of antisemitism in the conference. New Zealand and Japan have had generally cordial relations since the post-World War II period, with Japan being a major trading partner with New Zealand. These relations have held together despite policy disputes over whaling and the International Whaling Commission. New Zealand was one of the four founding participants of the Japan Exchange and Teaching (JET) Programme, established in 1987 by the Japanese Government. The NZ International Business Forum, established in 2006 by major export-focused companies in New Zealand, has as one of its key goals negotiations for a free trade agreement with Japan. Japan has helped, sending men and equipment, with the 2010 Canterbury earthquake. New Zealand sent an urban search and rescue team which had spent the previous three weeks searching buildings following the February 2011 Christchurch earthquake, and 15 tonnes of rescue equipment with the 2011 Tōhoku earthquake and tsunami. The government donated $2m to the Japanese Red Cross to support relief efforts. New Zealand recognised the independence of Kosovo in November 2009. Kosovo and New Zealand formed diplomatic ties in 2010, with Kosovo's Ambassador to New Zealand Muhamet Haliti presenting his credentials to the Governor-General of New Zealand early 2010. New Zealand has a 3,500 Kosovan (Albanian, Bosnian, Croatian, Serbian) community, mostly residing in Auckland. 450 Kosovo refugees were accepted to New Zealand in 1999, following the war with Serbia. All of whom are now New Zealanders. New Zealand is represented in Kosovo by its embassy in The Hague. Kosovo and New Zealand had close ties during the 1990s when New Zealand sympathised deeply with the Albanian majority population in Kosovo, whom suffered deeply from Serbian oppression. New Zealand also recognised the Kosovo Passport as the official and legal travel document for Kosovo in 2008, before recognising the country itself. In addition New Zealand previously had a deployment in Kosovo as part of the International Peacekeeping Force known as KFOR in 2000-2006 prior to being withdrawn. Kosovo has enjoyed much support from New Zealand in the United Nations and other international organisations. New Zealand however is yet to have any trade agreements and present official ambassadorial credentials to Kosovo. Historically there has been a strong link between New Zealand and the Netherlands. The first European sightings of New Zealand was by the Dutch explorer Abel Tasman in 1642 and New Zealand was named after the Dutch province of Zeeland. Relations however did not start well when Māori killed several of the Abel Tasman's crew after he sent out a shore party. Tasman mapped a section of the North Island and left and there was no further contact between the Netherlands and New Zealand for more than a hundred years. Once New Zealand was established as a state in 1840 relation have been good. The relationship was enhanced significantly with migration of large numbers of Dutch people to New Zealand after World War II. As a result of negotiations between the Dutch and New Zealand Governments a migration agreement was signed in October 1950. This resulted in thousands of Dutch immigrants coming to New Zealand in subsequent years. Peaking between 1951 and 1954. As of 2006, it is estimated that well over 100,000 New Zealanders have some Dutch connection. The 2006 census shows that 28,641 people identified their ethnic group as Dutch. New Zealand has an embassy in The Hague and the Netherlands has an embassy in Wellington and two consulate offices in Auckland and Christchurch. New Zealand and the Netherlands share very similar social attitudes and values and have a substantial history of working together on issues of international importance. They often cooperate closely in multilateral forums. In many international meetings the Netherlands delegation is seated immediately alongside New Zealand. Although diplomatic relations were established between New Zealand and North Korea in 2001, a 2007 trip by New Zealand Foreign Affairs Minister Winston Peters to Pyongyang, the capital city of North Korea was the first visit by a New Zealand foreign minister to that country. The trip was about establishing economic and political deals with economically crippled North Korea on the basis that it start dismantling its nuclear weapons facilities. United States Secretary of State Condoleezza Rice congratulated Peters on his effort in negotiating with a potential nuclear threat and welcomed Peters' actions on the matter. Both countries established diplomatic relations in 1905, after Norway’s independence. New Zealand is represent in Norway by the embassy in the Hague, Netherlands. Norway is represent in New Zealand by the embassy in Canberra, Australia. As of January 1, 2009, there are around 1,400 Norwegians living in New Zealand and 409 New Zealanders living in Norway. Reidar Sveaas, director of P&O Maritime Ltd. and honorary consul to Auckland said in 2000 that excellent opportunities existed for New Zealand to trade with the world's second largest oil-producing country, Norway. New Zealand joined 11 other countries in 2006 in delivering a formal diplomatic protest to the Norwegian Foreign Ministry in Oslo over Norway's plans to increase its whaling activities. 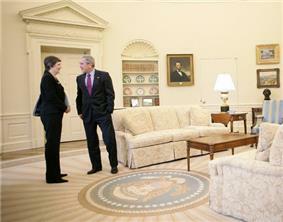 In 2004 Helen Clark, became the first New Zealand prime minister to ever visit Norway. She said that both countries see eye-to-eye on almost everything but the commercial harvesting of whales. The establishment of diplomatic relations between the South Korea and New Zealand began in March 1962, and the number of the South Koreans with long-term residents in New Zealand in 2012 was about 46,800. Despite the The Queen as the head of New Zealand and one of two official national anthems being God Save the Queen, the relationship has been variable over time. Up to about the 1960s, New Zealand also had extremely close economic relations with the United Kingdom, especially considering the distance at which trade took place. As an example, in 1955, Britain took 65.3 percent of New Zealand's exports, and only during the following decades did this dominant position begin to decline as the United Kingdom oriented itself more towards the European Union, with the share of exports going to Britain having fallen to only 6.2 percent in 2000. Historically, some industries, such as dairying, a major economic factor in the former colony, had even more dominant trade links, with 80–100% of all cheese and butter exports going to Britain from around 1890 to 1940. This strong bond also supported the mutual feelings for each other in other areas. Historically, New Zealand has fought shoulder to shoulder with the United States, especially in both world wars and in the Korean and Vietnam wars. During the Second World War, around 400,000 US troops were stationed in New Zealand prior to departing for battles like Guadalcanal. New Zealand is a Major non-NATO ally of the United States and has been since 1997. Despite the political contention over ANZUS, New Zealand forces have cooperated with U.S. forces subsequently in the 1991 Gulf War and in the 2001 U.S. invasion of Afghanistan. New Zealand forces did not participate in the 2003 invasion of Iraq, but a contingent of New Zealand army engineers assisted with reconstruction work in Iraq in the aftermath of the war, being based in Basra. New Zealand also participates in the ECHELON programme. In 2010, the United States and New Zealand began a new strategic partnership by signing the Wellington Declaration. According to the Prime Minister the Declaration was not a return to an ANZUS style security treaty, despite reports of increased military co-operation since 2007. New Zealand has well-established links to a number of Latin American countries, particularly in the economic sphere. New Zealand has Embassies in Mexico City, Santiago, Brasília and Buenos Aires – the first of which (Santiago) opened in 1972. The New Zealand Government's Latin America Strategy, published in May 2010, estimates New Zealand's annual exports to the region at NZ$1 billion, and New Zealand investments in the region (in areas such as agri-technology, energy, fisheries, and specialised manufacturing) at around NZ$1.3 billion. The Strategy argues that there is considerable scope to expand New Zealand's investment and services trade in the region. Focusing on six countries (Brazil, Mexico, Chile, Argentina, Uruguay and Peru), the Strategy posits that New Zealand should be seeking to: promote a better understanding of the region among New Zealand businesses to help identify prospects for increased investment, trade and joint ventures; lower barriers to business between New Zealand and Latin America; promote New Zealand tourism in the region; improve airlinks between New Zealand and the region; deepen education and research and science links. There are significant flows of tourists and students from Latin America to New Zealand. For example, in the year to June 2010, around 30,000 Latin Americans visited New Zealand. In addition, New Zealand has popular Working Holiday Schemes with Brazil, Argentina, Chile, Peru, Mexico and Uruguay. Diplomatic relations were cut off during the Falklands War, they were re-established in 1984. Argentina has an embassy in Wellington. New Zealand has an embassy in Buenos Aires. Both countries are members of the Cairns Group. Brunei high commission in Bandar Seri Begawan is accredited to New Zealand. New Zealand high commission in Kuala Lumpur is accredited to Brunei. Croatia is represented in New Zealand through its embassy in Canberra (Australia) and through an honorary consulate in Auckland. New Zealand is represented in Croatia through its embassy in Rome (Italy) and through an honorary consulate in Zagreb. Since 1964, New Zealand has contributed several times to the UN Peacekeeping Force in Cyprus (UNFICYP). Cyprus is represented in New Zealand through its high commission in Canberra (Australia) and through an honorary consulate in Christchurch. New Zealand is represented in Cyprus through its embassy in Rome (Italy) and through an honorary consulate in Nicosia. Denmark is represented in New Zealand through its embassy in Canberra (Australia), through a Trade Commission in Auckland and an honorary consulate in Wellington. New Zealand is represented in Denmark through its embassy in The Hague (Netherlands) and an honorary consulate in Copenhagen. Ethiopia and New Zealand have only recently began a formal relationship with the opening of the New Zealand embassy in Addis Ababa, Ethiopia in 2014. Informal relations, however, date back to 1937 when New Zealand supported Ethiopia in their request for continued recognition as a sovereign during the Italian occupation. New Zealand is represented in France through an embassy in Paris, which also accredited to Algeria. France is represented in New Zealand through an Embassy in Wellington. New Zealand has an embassy in Rome. However, New Zealand is accredited to the Holy See via its embassy in the Hague. Hungary is represented in New Zealand through its embassy in Canberra (Australia) and 3 honorary consulates (in Auckland, Christchurch and Wellington). New Zealand is represented in Hungary through its embassy in Berlin (Germany) and through an honorary consulate in Budapest. New Zealand has a high commission in Kuala Lumpur. Malaysia has a high commission in Wellington. Mexico has an embassy in Wellington. New Zealand has an embassy in Mexico City. Both nations are members of APEC and the OECD. Pakistan has a High Commission located in Wellington. New Zealand has a Consulate-General in Karachi. New Zealand is represented in Serbia through its embassy in The Hague (Netherlands). Serbia is represented in New Zealand through its embassy in Canberra (Australia). Serbian Ambassador Milivoje Glišić, presented his Letter of Credence to the Governor General of New Zealand Silvia Cartwright on 4 February 2003. New Zealand and Serbia have four bilateral treaties in force including the most favoured nation treaty from 1960. Trade between the two countries was based on a very modest exchange totalling US$2.3 million in 2006 but it rose significantly in 2007 to EUR 805 million. In the 2006 census, over 1,000 New Zealand residents claimed to be of Serbian ethnicity. New Zealand has a high commission in Pretoria. South Africa has a high commission in Wellington. The ROK's Investment in New Zealand (cumulative total at the end of 2013) $US 15.9 million. New Zealand has an embassy in Ankara. Turkey has an embassy in Wellington. New Zealand is represented in Uruguay through its embassy in Buenos Aires (Argentina) and through an honorary consulate in Montevideo. Uruguay is represented in New Zealand through its embassy in Canberra (Australia) and through an honorary consulate in Christchurch. In November 2001, the Prime Minister, Helen Clark, paid the first visit to Uruguay by a New Zealand Head of Government. In November 2007 the President of Uruguay, Tabaré Vázquez paid the first ever visit of an Uruguayan head of state to New Zealand. Both countries are full members of the Cairns Group and of the Convention for the Conservation of Antarctic Marine Living Resources. ^ D.J. McCraw, "The Zenith of Realism in New Zealand’s Foreign Policy," Australian Journal of Politics & History (2002) 48#3 pp 353-368. ^ John Singleton and Paul L. Robertson (1997). Britain, Butter, and European Integration, 1957–1964, Economic History Review 50 (2), 327–347. ^ Source: CIA World Factbook, 2003 edition (external link). ^ a b Source: NZ Ministry of Foreign Affairs and Trade. ^ Source: Statistics New Zealand. ^ See further R. Thakur 1989 (October), "Creation of the nuclear-free New Zealand: brinkmanship without a brink," Asian Survey 29: 919–39. ^ Xinhua, "NZ, U.S. links delicate on nuclear ban", People's Daily Online, 9 May 2006. ^ Sources: NZ Ministry of Foreign Affairs and Trade, French Ministère des Affaires étrangères. ^ Ethnic group (total responses) for the census usually resident population count, 2006 (Excel 97 format), Classification counts, 2006 Census, Statistics New Zealand.